One of the easiest ways to rank your websites high in Google for your target keywords is by building a private blog network using high PR domains. Google LOVES high pagerank backlinks pointing from trusted, authority domains. To get started, you need to find these domains, buy them then build links pointing to your money sites. I’m going to show you how to build your private blog network for cheap and rank for any keyword fast. I wrote a previous post on picking domains for your private blog network so be sure to read that first. Both ways work great however domain vendors will be the most expensive option because they serve as the middlemen. I recommend using ExpiredDomains.net to research through expired domains. Another good tool is RegisterCompass.com. For a more detailed explanation, read this Domain Buying Guide by Heis Domains. How Much Does Each Domain Cost? PR2 domains can be found for between $5 to $25. The higher the PR, the more expensive the domain. You need a little bit of money to get started using this technique. If you are short on funds, then do some freelance SEO work or get a job to pay for this. Once your network is setup, you can also make money posting other people’s blog posts on your network. Be careful though because you don’t want to leave too many footprints. That’s why separate hosting is crucial. I’ll talk about that later but just remember to take action on this. Check my cheap web hosting section for a complete list of 1 dollar and discount web hosting for your private blog network. If you build a smaller network, then put 2-3 domains per web hosting max. The best way is one domain per hosting account to get maximum results. That’s around $30 per domain. So a network of 10 domains will cost around $300 per year to manage. That’s extremely cost effective because you control 100% of the backlinks and can also sell your SEO services to your clients. Compared to the expensive monthly SEO packages that cost from $49 to $5,000 per month, I think you CANNOT afford to ignore the power of private blog networks. Different IPs for each domain is criticial to avoid leaving footprints. Your web host probably sells unique IP addresses for around $1 per month. This should work fine for most blog networks. Remember, Google is a HUGE company and they don’t have time to hunt out and deindex smaller private blog networks. They only focus on the big guys. If you’re doing Local SEO or just want to rank your target keywords, then you will 99% of the time be ok. Just make sure to at least use unique IPs. Different web hosts altogether is best. Get WordPress up quickly and install a different wordpress theme for each domain. Your web host should have Cpanel WordPress installation that takes a few minutes. Go to the WordPress theme directory and find a unique theme to change the look of each domain. Go to Settings -> General in the WP admin dashboard to change the WordPress blog title and description to your target keywords. Go to Dashboard -> Settings to change the permalink structure to Post Name or Day and Day and Name. Your domain’s pagerank will be highest on the homepage so make sure the backlinks are on the page with the PR. Write a 200 to 300 word article or outsource this using Fiverr, TextBroker or iWriter. The big internet marketing forums have affordable freelance writers too such as Warrior Forum and Digital Point. I sometimes use EzineArticles to get unique content by searching for a related article then adding a few sentences to the article. They always get indexed by Google so this is a cheaper alternative if you want to save some money. The most important thing is that your link is on the page with the PR. If your blog has post excerpts or snippets on the homepage, then you aren’t passing any pagerank juice to the link. Although, the inner page may earn its own pagerank in the future. It’s best to use full posts on the homepage to gain the most pagerank juice benefits. Do not start building backlinks with just your target keyword. Google sees this practice as completely unnatural. Mix up the anchor text to avoid Google penalties. Go to Google Webmaster tools -> Search queries to find more potential keywords to target. These are longtail searches that you may have missed or forgotten about. Once you insert your backlinks, publish the post as sticky to keep it on the homepage forever. That’s it! You build a strong PR backlink to your money sites. Now the next step is managing multiple wordpress blogs. Once you start building lots of high PR domains, you will go crazy trying to manage everything. There’s stuff like login information, wordpress updates, posting to each blog and annoying time consuming tasks to manage. I use ManageWP to manage all my blog network sites under 1 single dashboard. It saves me HOURS every week and I cannot run a network without it. Check out this post on managing multiple blogs for more information. Use this ManageWP discount code to save extra on your subscription. Next, it’s time to switch from a regular Google keyword checker to a real-time Google SERP rank tracker. Because building a private blog network boosts your rankings so much that you will enjoy tracking them. Plus, you get a feel of how many links you need to reach page 1 on Google. 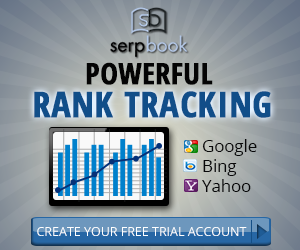 I use SerpBook to track my SERP rankings in Google, Yahoo! and Bing. It allows you to easily add keywords in bulk then start tracking them in real-time. Other cool features include PDF/Excel reports, Email notifications and Local SEO keyword tracking. It’s another must have tool. Read my Serpbook review for a complete overview. The last step is to take action on this information. It is simply powerful and I’ve ranked brand new websites on page 1 using just 1 or 2 PR links from my private blog network. I’m talking about websites in VERY competitive niches so this works for most industries. If you are busy with work or family, then please consider outsourcing all the work to me. I have build dozens of domain networks and know how to get everything up and running fast. I will build a private blog network to your specific requirements so don’t hesitate to contact me! Wow! I am impressed with data. Great post. Very detailed, easy to follow and understand.